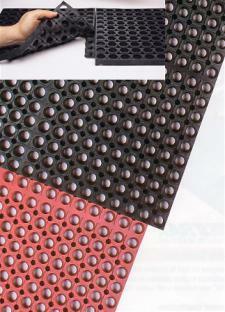 Anti-fatigue mats are a great way to ensure safety. The winter months can mean a burden for the cleaning crew, as people track in salt, water and snow that wreaks havoc on the flooring of any building. Not only is this problematic from a facilities standpoint, but it could be putting employees in safety jeopardy as they are unaware of the excess moisture and accidentally slip and fall. According to SFM, winter can be a real hazard for employees, and it’s important for facilities managers to be on top of the slipping risks around the workplace. It’s never too early to start preparing, and the news provider reports that getting a plan in place even before a storm hits can be huge. One way to stay prepared is through flooring. Anti-fatigue mats can help, because they provide extra traction, and even if moisture is tracked on, the texture helps employees feel confident as they walk by. Occupational Health and Safety reports that you’ll also want to educate employees on slipping and tripping hazards so they’re more alert. When employees are more aware of their surroundings, the news provider reports they tend to be more prepared and agile as they move throughout the workplace, which could prepare them if they happen to slip and reduce the chance of injury.